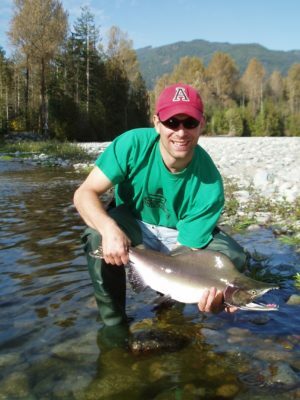 Cory sampling fish in British Columbia, Canada. Cory collecting blood from a barracuda in The Bahamas. 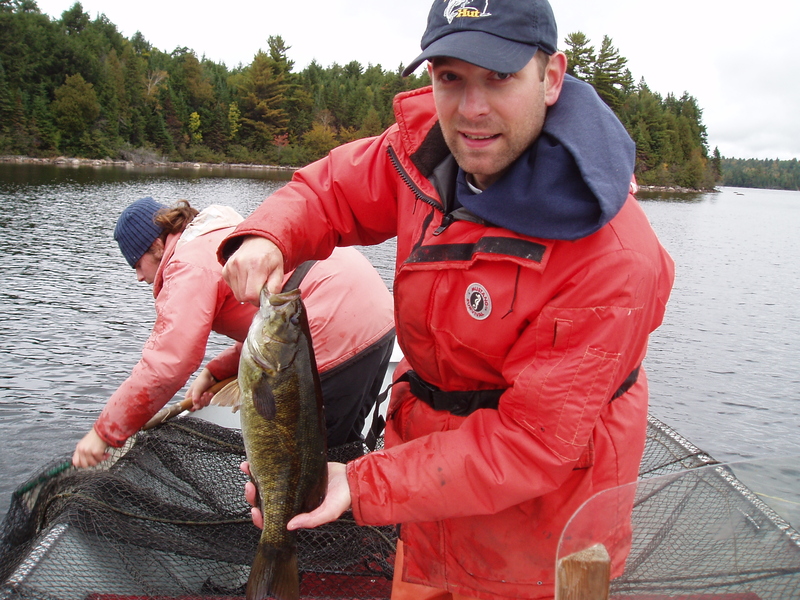 Cory releasing a smallmouth bass during sampling in Ontario, Canada. 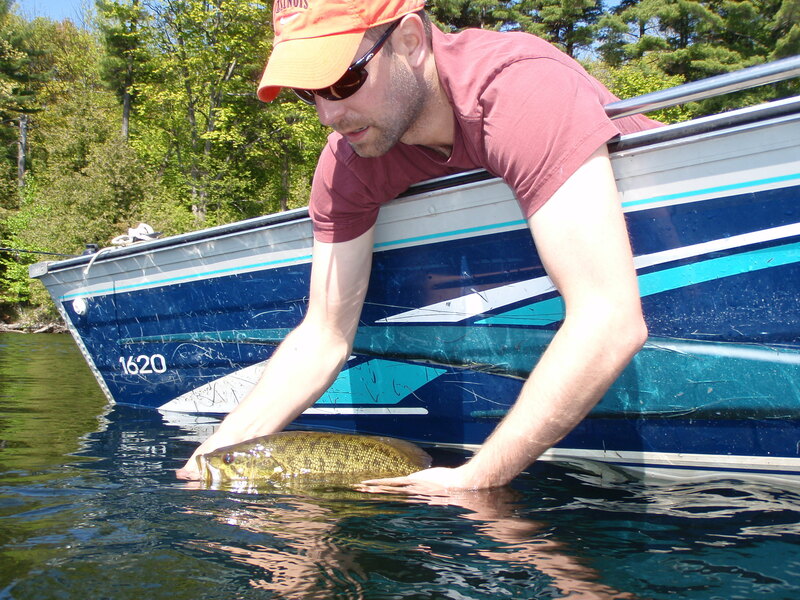 Telemetry work in Ontario, Canada, to track the movements of smallmouth bass. 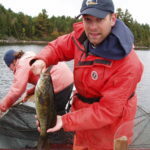 Collecting smallmouth bass from a trap net in Ontario, Canada. 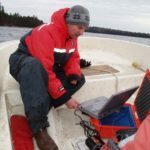 I have always enjoyed being outdoors, and also knew that I wanted to work in science for a career. From an early age, I enjoyed fishing, and, when an opportunity came along to begin working in fisheries, I gladly accepted the offer, and have been engaged in fisheries ever since. 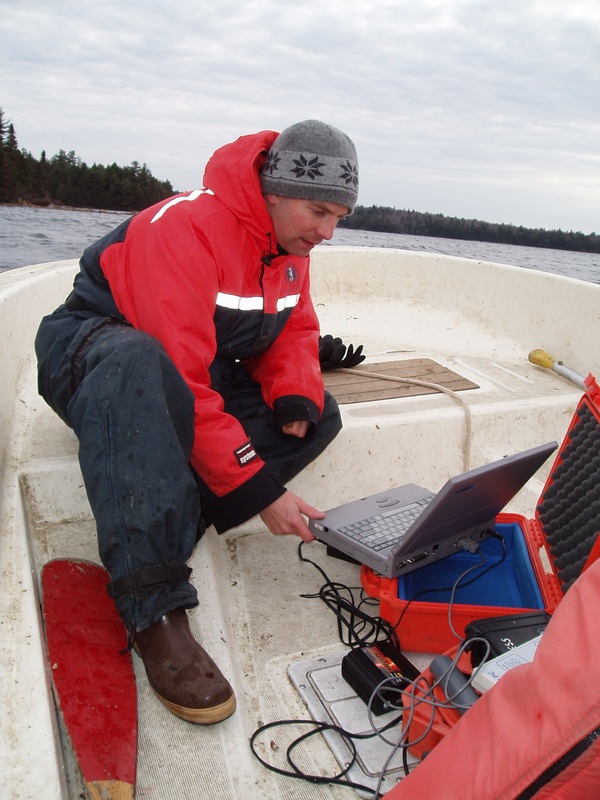 My research group and I are currently involved in a number of different research areas related to the Great Lakes. For example, we are about to start a project that will quantify the energetic costs of stream restoration activities for fish. We have spent several years working to implement non-physical barriers to prevent bigheaded carp from reaching the Great Lakes from the Illinois River. We also have been working to understand why fish strike fishing lures, which will allow us to quantify how harvest can shape fish populations, and provide information to managers on how to sustain catch rates. During graduate school, I conducted a number of studies looking at how individual fish respond when captured in fishing tournaments. 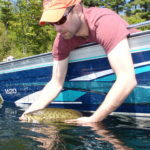 One of the outcomes of this work was a number of recommendations for anglers and tournament organizers on how to conduct fishing tournaments to minimize the impact of tournaments on fish. To share the results of this research, I have given many seminars and talks to anglers and tournament groups, and I really enjoy these kinds of presentations. Anglers and tournament organizers have always been supportive of our research, and also have been willing to implement the changes and suggestions that we have generated. It is always rewarding to see the results of our research put into action! Educators are critical for ensuring that the results of research are shared with stakeholders or resource users that need to know findings. Educators are also able to connect with the next generation of scientists and outdoor enthusiasts to get them excited about the natural environment and science. I think the two most critical skills for students interested in science are communication and perseverance. So much of science is about communication – whether it be communicating your research ideas to a funding agency to obtain support for a proposed project, or communicating the results of a completed study to share findings with peers or stakeholders. Communication, both in writing and verbally, is very difficult and takes years to perfect, but is key for success in science. Similarly, many aspects of science often do not proceed as planned – projects hit unintended speedbumps, equipment breaks down and it can often be a struggle to have papers accepted into journals. Persevering and being determined to succeed are critical skills to develop.